These little dogs are sometimes known as the Royal Spaniels due to being great favourites of the Stuart kings. Accompanied by a rippling sea of dogs wherever he went, the King's deathbed was cluttered with them, much to the consternation of the attending Archbishops. Signs "Beware of the Dogs" that appeared in the Royal chambers meant "don't tread on them".The King Charles was most probably bred from dogs brought to England from Japan, and crossed with local breeds and then with a Pyrame Spaniel brought from France. The King Charles Spaniel, which ranks among the rarer breeds in Australia, should not be confused with its larger cousin, the Cavalier King Charles Spaniel. King Charles Spaniels live from between 9 to 15 years of age. Outgoing and sure of themselves, King Charles Spaniels are individuals with a strong personality that enjoy making their presence felt. The breed can be very affectionate and delights in having affection lavished on it. Highly intelligent, these dogs quickly learn about the running of the household. 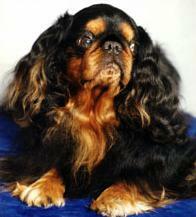 The King Charles Spaniel will share with others, as long as the others realise it is "King". The coat will need to be combed and brushed on a regular basis. It is soft and silky (sometimes waved) and dirt will drop out. Ears have to be attended to carefully and combed regularly. Feathering on legs and ears should always be free of knots. Toenails should be checked because long nails can mean sore feet. It may be necessary to bathe the eyes and to wipe away "tear stains". 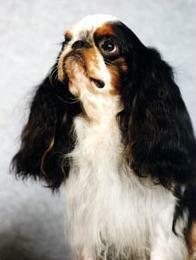 The King Charles Spaniel has an undershot bottom jaw that gives the dog its distinctive chin. Its tail may be full or docked – some dogs are born with a kink in their tail and breeders sometimes prefer to dock at that point. Ideally Charlies are suited to an adult household. While good with all ages, this breed prefers adult company.